Read the summaries of two UR2020 Planning Meetings in Tokyo and Washington, DC. 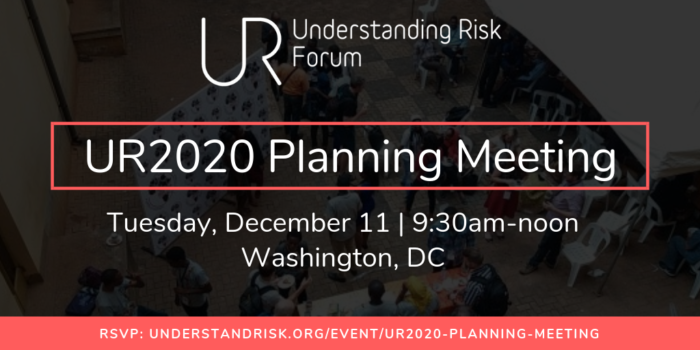 We invited members of the UR community to gather in Washington, DC, and help shape the next Understanding Risk Forum in Singapore. The second planning meeting took place December 11, 2018, on the sidelines of the American Geophysical Union Fall Meeting. The session consisted of a fun and informal conversation in the spirit of UR, exploring questions and emerging trends in disaster risk analysis and communication toward a vision for UR’s 10-year anniversary. Read more. What don’t you like about UR?